SkylineDx is a commercial-stage company with an in-house team that has the necessary skills for taking assets from early-stage discovery through to developing, validating and early commercialization of innovative diagnostic tests in collaboration with major academic centers of excellence. Our purpose is to serve society with science-based solutions. Incorporated in 2013, we developed early-stage assets in multiple myeloma into a commercial product, MMprofilerTM, CE-IVD registered in Europe and available as LDT in the US. This test is based on our proprietary SKY92 (or EMC92) gene signature – a prognostic signature of 92 genes for high-risk multiple myeloma – confirmed in 16 independent cohorts. Through a strategic collaboration with the Mayo Clinic, USA, our science-based solutions are now being developed in a new disease area. The collaboration with Mayo Clinic will optimize and further develop an algorithm to identify molecular risk factors associated with sentinel lymph node (SLN) metastasis for patients with melanoma. 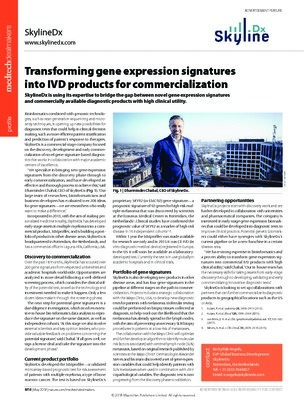 We have a strong expertise in bioinformatics and a proven ability to transform gene-expression-signatures into commercial IVD products with high clinical utility. We are interested in early-stage gene expression biomarkers and collaborations with partners that can further commercialize our diagnostic products in geographical locations such as the US or Asia.